As they age, some men seek to improve the appearance of their face and neck through cosmetic surgery. Facial surgery covers a number of different procedures, including a facelift and forehead lift, eyelid surgery, nose surgery, facial implant surgery, and refinishing treatments for facial skin (such as chemical peels and dermabrasion). Sometimes two or more of these procedures are performed at the same time. Although facial surgery cannot reverse the aging process, it can give the face a younger, rejuvenated look that can increase your self-confidence and sense of well-being. 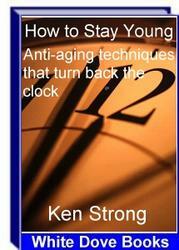 With age, the muscles and skin of the face and neck begin to sag, and the skin begins to lose elasticity. A facelift can restore a more youthful appearance by removing excess fat, tightening underlying muscles, and repositioning the skin over the face and the neck. Most people who have a facelift are in their 40s, 50s, and 60s, but even older people can benefit from the procedure. Before deciding to have a facelift, discuss the procedure with a board-certified (see page 94) plastic surgeon to determine whether this type of surgery is right for you. Before the procedure, your surgeon will evaluate your face and discuss your expectations about the surgery. He or she also will describe the risks and benefits of the surgery and discuss the costs involved. In addition, the surgeon will describe the procedure itself and the type of anesthesia to be used. You may want to grow your hair a bit longer before having surgery to help hide the scars afterward. pulled back over the face, and the excess skin is trimmed away. The surgeon Cosmetic closes the incisions with sutures. He or she may temporarily place a small tube Surgery under the skin behind the ear to drain any collected blood or fluid. After surgery you probably will feel numbness and swelling in your face. These sensations are normal. Keeping your head elevated and still will minimize the swelling. Your face may look bruised and puffy, but it will look more normal after a few weeks. The surgeon will remove your stitches in about a week. Most people return to work in 1 or 2 weeks. The surgery causes mild pain that can be treated with pain relievers such as acetaminophen. You may find that you have to begin shaving in new areas because beard-growing skin may have been repositioned to the back of your neck or behind your ears. Any scars from the facelift will most likely be hidden by your hair or by the natural creases in your face and neck. The scars will gradually fade. Your facelift will probably last about 10 years; to retain your youthful appearance, you may have to repeat the procedure. A forehead lift, also called a brow lift, is designed to restore a more youthful appearance to the forehead and make the person look more rested and alert by smoothing out lines and raising the eyebrows. Although it can help people of any age with deep wrinkles in their foreheads, a forehead lift is most often performed on people between ages 40 and 70. It is often performed at the same time as a facelift. Plastic surgeons can perform a forehead lift in either of two ways. In the traditional method, the surgeon makes an incision across the top of the forehead, under the hairline, from ear to ear. Next, the surgeon lifts away the skin of the forehead so he or she can remove or reposition the underlying muscle, which is the source of the wrinkles. He or she will then pull the forehead skin upward and trim away any excess skin and also may elevate the eyebrows before replacing the skin of the forehead and closing the incision with sutures or clips. In an endoscopic forehead lift, the surgeon uses an endoscope (a flexible viewing instrument that transmits images to a video monitor). The surgeon inserts the endoscope under the skin of the forehead through four or five small incisions in the scalp. The endoscope allows the surgeon to see and work on the muscle and tissues beneath the skin. After completing the procedure, the surgeon will close the incisions with sutures or clips. This procedure is ideal for men with little hair because the scars are very small. sutures or clips in 2 weeks. Recovery from an endoscopic forehead lift is quicker and less painful than recovery from a traditional forehead lift. Stitches or clips usually are removed within a week. 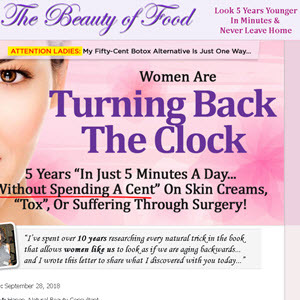 You can return to work in about 10 days after either type of forehead lift. The aging process causes the skin of the eyelids to droop, and fat often begins to accumulate above and below the eyes, producing "bags." Eyelid surgery (known medically as blepharoplasty) can be used to alleviate these age-related changes. Now the second most common type of plastic surgery performed on men, eyelid surgery can give you a younger appearance but will not remove crow's-feet or other wrinkles from around the eyes, eliminate dark circles, or raise sagging eyebrows. In some cases, eyelid surgery can actually improve vision if the eyelids droop and stretch so much that they cover part of the eyes. Most eyelid surgery is performed on people over age 35. While planning your eyelid surgery, the surgeon will test your vision and check your ability to produce tears. Having dry eyes or not being able to produce enough tears can make the procedure more risky. Other disorders that increase the risks of eyelid surgery include a detached retina, glaucoma, thyroid problems, high blood pressure, heart disease, and diabetes. The surgeon will discuss the risks of the procedure and possible complications that can occur, such as temporary double or blurred vision, temporary swelling at the comers of the eyes, sensitivity to light, and the appearance of whiteheads near the surgical site. Some people may have difficulty closing their eyes while sleeping after eyelid surgery, but this complication is usually temporary. Using local or general anesthesia, the surgeon will make incisions in the creases of your upper lids (and beneath the lashes of the lower lids if they are to be altered). The surgeon removes excess skin, trims excess fat, and closes the incisions with fine sutures. In some cases the incision is made inside the lower lid to avoid producing visible scars. Surgery to reshape the nose, known as rhinoplasty, can change the appearance of your nose in a number of ways. The surgeon can alter your nose's size, remove a hump, alter the tip, narrow the nostrils, or change its angle. Nasal surgery can even relieve some breathing problems, such as those caused by a deviated septum (crookedness of the thin wall of cartilage and bone that divides the nostrils). When discussing nose-reshaping surgery, you and the surgeon will work together to develop a concept or goal for a new shape that will balance the rest of your face and enhance your appearance. How closely your final result resembles this goal is unpredictable. Your surgeon also will explain the risks and possible complications of nose reshaping, which, although rare, include infection, nosebleed, and impaired breathing. In about one in 10 people, nasal surgery has to be repeated to correct a minor irregularity or problem with the cosmetic result. During surgery, the surgeon separates the skin over the nose from the underlying supporting structures of bone and cartilage so he or she can reshape them. The skin is then replaced over the nose. After the procedure, the surgeon places a splint on the nose to help retain the new shape. Following surgery, your face will be swollen and you may have slight pain in your nose along with a headache. Swelling and bruising also will appear around the eyes. You can reduce the swelling by applying cold, wet compresses over the areas. You will not be able to blow your nose for about a week to allow the area to fully heal. After 5 to 7 days the surgeon will remove the splint and any sutures or nasal packing; you can then return to work. Although you will be allowed to wear contact lenses, you will not be able to wear glasses for about 6 weeks, unless you tape them to your forehead to avoid direct pressure on the nose. In some cases it may take a year for the swelling to completely subside and reveal the final result. Many people have skin-refinishing procedures to achieve smoother-looking skin. The most common types of procedures include chemical peeling, dermabrasion, and laser skin resurfacing. The main difference between a chemical peel and dermabrasion and laser skin resurfacing is that the two latter procedures use surgical instruments to remove the top layer of skin, while a chemical peel uses a chemical solution. Concerns chemical peel may be recommended for men who have wrinkles or blemishes from sun exposure or who have uneven skin coloring. Sometimes doctors also use a chemical peel to remove precancerous skin growths, improve the appearance of acne scars, or control acne. There are three main types of chemicals used in a chemical peel: alpha-hydroxy acids (AHAs), trichloroacetic acid (TCA), and phenol. Common AHAs include glycolic, lactic, and fruit acids. They are the mildest chemical peel formulas but usually have to be reapplied a number of times to achieve the best results. TCA is generally stronger than AHAs but still may require repeated treatments. Before the peel, the doctor may apply a vitamin A-containing cream (tretinoin) that enhances the results of the peel. AHA and TCA peels (light peels) require minimal recovery time. They refresh the skin by removing dead cells from the surface of the skin and stimulate formation of new collagen (a tough, fibrous, structural protein that is an important part of body tissues) to reduce future wrinkling. These peels do not remove existing wrinkles. Phenol is the strongest chemical available for chemical peels and is used to minimize coarse wrinkles and scars from acne. 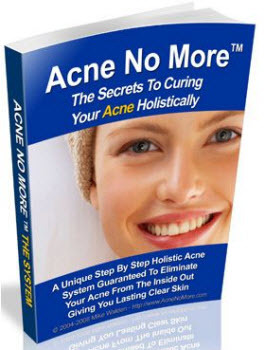 Results are striking and long-lasting, but healing can take up to several months. Phenol peels (deep peels) create a superficial burn that heals in about a week, revealing pinker skin. The pinker skin fades to a more normal tone in several months, but this tone may be lighter than the surrounding skin. Although the initial pinker skin is quite noticeable, it can easily be hidden with makeup. However, because most men are not willing to wear makeup, deep peeling is generally not a practical choice for men. Anesthesia is not required for a light peel, but it is required for the deeper, phenol peel. During a light peel you may feel some temporary stinging or burning as the doctor applies the solution to your face. After having the procedure you need to use a strong sunblock on your face to protect the sensitive skin from burning. Sunblock also helps to prevent the irregular skin coloring that can occur after a phenol peel. Some states do not require that a chemical peel be done by a licensed physician, but it is important to find a doctor (or a registered nurse who works under a doctor's supervision) with experience in giving chemical peels because the procedure carries some risk of infection and scarring. After your treatment you will probably notice that the skin on your face is red and dry. It also may scale or flake somewhat. These conditions are only temporary. After a phenol peel your face may swell considerably—your eyes may even swell shut—and you may need someone to help out at home for a couple of days. The chemical peel will give your face a fresh, new look but will not prevent any future signs of aging or damage from sun exposure. Dermabrasion Dermabrasion helps to rejuvenate the skin by controlled surgical sanding of the face. Doctors use dermabrasion to treat skin that has been scarred by accidents or surgery or to smooth facial wrinkles. Neither procedure is recommended for people with dark skin because their complexions could become permanently blotchy or discolored. In fact, a change in skin color is the most common complication, even in light-skinned people. It is best to seek dermabrasion from a qualified plastic surgeon or dermatologist; the technique is sometimes offered by inadequately trained nonphysicians. Dermabrasion requires local anesthesia, given along with a calming sedative. Serious cases of wrinkles or scarring may require general anesthesia. To perform dermabrasion, the doctor "sandpapers" away the top layer of skin, using a motorized wire brush device. After surgery, your skin will be swollen and feel sore, as if you fell and scraped the side of your face. 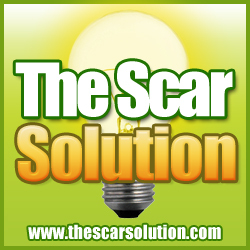 The skin on your face will scab over and, when the scab falls away, new, pinker skin will be revealed. You will not be able to shave for a while; follow your doctor's instructions about when to resume shaving. Your face will heal in about a week, but your skin will be pinker than usual for several months. You will need to use a strong sunblock to protect the sensitive skin from burning until the pink has faded to a more normal tone. This tone may be lighter than the surrounding skin; using sunblock also helps prevent this irregular skin coloring. Laser Skin Resurfacing Surgeons sometimes use lasers to treat fine lines, wrinkles, scars, and various skin lesions. Some surgeons believe that the precise nature of the laser makes it the treatment of choice. A laser is a device that focuses highly concentrated beams of light on the surface of the skin to create a controlled, superficial burn that heals on its own. 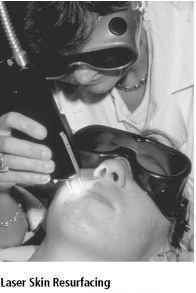 Laser treatment requires either local or general anesthesia. Your face will heal in about a week, but your skin will be noticeably pinker for several months. You will need to use a strong sunblock to protect the sensitive skin from burning until the pink has faded to a more normal tone. This tone may be lighter than the surrounding skin; sunblock also helps prevent this irregular skin coloring. Resistance to wearing makeup to cover the pinker skin while it heals makes this procedure an impractical choice for most men. Concerns also can be used in other parts of the body—such as the chest or calves (see below)—to contour them and make them look more muscular. Usually performed using local or general anesthesia, facial implant surgery can take 30 minutes to an hour. Most implants are made of solid silicone, which has not been shown to be harmful. Talk to your plastic surgeon if you have concerns about the safety of the implanted material. Various shapes and sizes of implants are available to simulate natural cheekbones and jawbones. During the procedure the surgeon will make an incision and insert the implant. The incision is often made inside the mouth, so the scar will not be visible. He or she will then close the incision with dissolving sutures. Swelling can be significant after surgery, especially during the first 48 hours. The doctor probably will restrict your diet (to soft foods and liquids) and activities for a few days, depending on the type of surgery you have had. He or she also will give you instructions about cleaning your teeth. Complications are infrequent but can include infection. The implant also can shift out of place after surgery, requiring a second operation to correct its placement. Recovery time for a facial implant is usually minimal, but you should check with your surgeon before returning to work. Implants can be used to augment the contours of the chest or calves. Surgery for either type of implant is performed under general anesthesia. For a chest implant the incision is made under the arm, and the implant is inserted over the pectoral muscles. For a calf implant the incisions are made behind the knees, and the implants are inserted over the calf muscles. Each operation lasts about 1 to 2 hours. Usually you can return to work about 1 week after surgery. You can begin exercising again about 1 month after surgery. Infection, although rare, is a possible complication of either surgery.